By taking advantage of gravity and the water cycle, we have tapped into one of nature's engines to create a useful form of energy. In fact, humans have been capturing the energy of moving water for thousands of years. Today, harnessing the power of moving water to generate electricity, known as hydroelectric power, is the largest source of emissions-free, renewable electricity in the United States and worldwide. Although the generation of hydropower does not emit air pollution or greenhouse gas emissions, it can have negative environmental and social consequences. Blocking rivers with dams can degrade water quality, damage aquatic and riparian habitat, block migratory fish passage, and displace local communities. The benefits and drawbacks of any proposed hydropower development must be weighed before moving forward with any project. Still, if it's done right, hydropower can be a sustainable and nonpolluting source of electricity that can help decrease our dependence on fossil fuels and reduce the threat of global warming. On Earth, water is constantly moved around in various states, a process known as the hydrologic cycle. Water evaporates from the oceans, forming into clouds, falling out as rain and snow, gathering into streams and rivers, and flowing back to the sea. All this movement provides an enormous opportunity to harness useful energy. In 2011, hydropower provided 16 percent of the world’s electricity, second only to fossil fuels. Worldwide capacity in 2011 was 950 gigawatts (GW), with 24 percent in the China, eight percent in the United States, and nine percent in Brazil . Globally, hydroelectric capacity has more than doubled since 1970. In the United States, hydropower has grown steadily, from 56 GW of installed capacity in 1970 to more than 78 GW in 2011 . However, as a percentage of total U.S. electricity generation, it has fallen from 12 percent in 1980 to 7 percent in 2012, largely as a result of the rapid growth in natural gas power plants and other renewable energy technologies such as wind and solar . Since hydropower depends on rivers and streams for generation, the potential to use hydropower as a source of electricity varies across the country. For example, the Pacific Northwest (Oregon and Washington) generates more than two-thirds of its electricity from hydroelectric dams . The Grand Coulee dam on the Columbia River in Washington is one of the largest dams in the world, with a capacity of more than 6,750 megawatts (MW). In addition to very large plants in the western states, the United States has many smaller hydropower plants. In 1940 there were 3,100 hydropower plants across the country, though by 1980 that number had fallen to 1,425. Since then, a number of these small plants have been restored; as of 2013, there were 1,672 hydro plants (not including pumped storage) in operation . These plants account for only a tiny fraction of the dams that block and divert our rivers. In order to generate electricity from the kinetic energy in moving water, the water has to move with sufficient speed and volume to spin a propeller-like device called a turbine, which in turn rotates a generator to generate electricity. Roughly speaking, one gallon of water per second falling one hundred feet can generate one kilowatt of electricity. To increase the volume of moving water, impoundments or dams are used to collect the water. An opening in the dam uses gravity to drop water down a pipe called a penstock. The moving water causes the turbine to spin, which causes magnets inside a generator to rotate and create electricity. There are a variety of types of turbines used at hydropower facilities, and their use depends on the amount of hydraulic head (vertical distance between the dam and the turbine) at the plant. The most common are Kaplan, Francis, and Pelton wheel designs. Some of these designs, called reaction and impulse wheels, use not just the kinetic force of the moving water but also the water pressure. The Kaplan turbine is similar to a boat propeller, with a runner (the turning part of a turbine) that has three to six blades, and can provide up to 400 MW of power. The Kaplan turbine is differentiated from other kinds of hydropower turbines because its performance can be improved by changing the pitch of the blades. The Francis turbine has a runner with nine or more fixed vanes. In this turbine design, which can be up to 800 MW in size, the runner blades direct the water so that it moves in an axial flow . The Pelton turbine consists of a set of specially shaped buckets that are mounted on the outside of a circular disc, making it look similar to a water wheel. Pelton turbines are typically used in high hydraulic head sites and can be as large as 200 MW. Hydropower can also be generated without a dam, through a process known as run-of-the-river. In this case, the volume and speed of water is not augmented by a dam. Instead, a run-of-river project spins the turbine blades by capturing the kinetic energy of the moving water in the river. Hydropower projects that have dams can control when electricity is generated because the dams can control the timing and flow of the water reaching the turbines. Therefore these projects can choose to generate power when it is most needed and most valuable to the grid. Because run-of-river projects do not store water behind dams, they have much less ability to control the amount and timing of when electricity is generated. Another type of hydropower technology is called pumped storage. In a pumped storage plant, water is pumped from a lower reservoir to a higher reservoir during off-peak times when electricity is relatively cheap, using electricity generated from other types of energy sources. Pumping the water uphill creates the potential to generate hydropower later on. 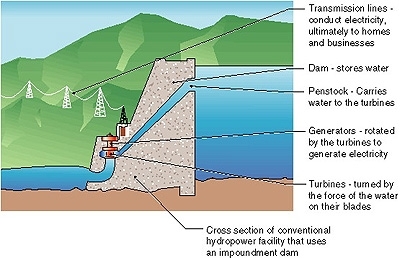 When the hydropower power is needed, it is released back into the lower reservoir through turbines. Inevitably, some power is lost, but pumped storage systems can be up to 80 percent efficient. There is currently more than 90 GW of pumped storage capacity worldwide, with about 20 percent of that in the United States. The need to create storage resources to capture and store for later use the generation from high penetrations of variable renewable energy (e.g. wind and solar) could increase interest in building new pumped storage projects . While hydropower generation does not emit global warming gasses or other air pollutants, the construction and operation of hydropower projects can have environmental and societal consequences that greatly depend on where the project is located and how it is operated. Dams that have flooded areas with live vegetation can emit methane, a powerful global warming gas, as that organic material decomposes. For example, the Tucurui dam in Brazil created a reservoir in the rainforest before clearing the trees. As the plants and trees began to rot, they reduced the oxygen content of the water, killing off the plants and fish in the water, and released large quantities of methane. Hydropower projects can reduce the flows in rivers downstream if the upstream flows are trapped behind a reservoir and/or diverted into canals that take the water off stream to a generation unit. Lowering the flows in a river can alter water temperatures and degrade habitat for plants and animals. Less water in the river can also reduce oxygen levels which damage water quality. Water is typically stored behind a dam and released through the turbines when power is needed. This creates artificial flow patterns in the downstream river that may be very different from the flow patterns a river would naturally experience. For example, rivers fed mostly by snowmelt may experience much higher flows in the winter and spring than the summer and fall. Hydropower operations may differ from these natural flow patterns, which has implications for downstream riparian and aquatic species. If water levels downstream of a hydropower project fluctuate wildly because of generation operations, fish could be stranded in suddenly shallow waters. If operations cause a more static flow schedule throughout the year than what the river would normally experience, the movement of sediment along a river section could be disrupted, reducing habitat for aquatic species. Fewer seasonal flow events could also cause a riparian corridor to thicken into a less dynamic channel as saplings that would usually be seasonally thinned by high flows are able to mature. Dams can also block the migration of fish that swim upstream to reach spawning grounds. In the Pacific Northwest and California, large dams have blocked the migration of coho, chinook, and sockeye salmon from the ocean to their upstream spawning grounds. The number of salmon making the journey upstream has fallen 90 percent since the construction of four dams on the lower Snake River. Some steps are being taken to move fish around the dams, such as putting them in barges or building fish ladders, but success has been limited. Downstream fish passage can also be a challenge since young fish can be chewed up in the turbines of the dam as they head towards the ocean. The flooding of land to create reservoirs can also eliminate areas where people live or grow crops. The Balbina dam in Brazil, for example, flooded 2,360 square kilometers, an area the size of Delaware . Population density is typically higher along rivers, leading to mass dislocation of urban centers. The Three Gorges Dam in China dislocated nearly 1.2 million people . Wildlife habitats destroyed by reservoirs can be especially valuable. In South America, 80 percent of the hydroelectric potential is located in rain forests, one of the most rich and diverse ecosystems on Earth. The Rosana dam in Brazil destroyed one of the few remaining habitats of the black-lion tamarin, a rare and beautiful species of long-haired monkey. In the United States, most non-federal hydropower plants are required to obtain an operating license from the Federal Energy Regulatory Commission (FERC). These licenses, which govern the operations of a plant for 30 to 50 years, play a large role in determining how a hydropower facility’s operations impact local environmental, cultural, and recreational resources. Therefore, the re-licensing process is an important opportunity to reassess and adjust, if necessary, the operations of a project to better align itself with the current needs and values of the environment and the public. Hydropower re-licensing processes across the country have resulted in increased flows to support aquatic and riparian habitats, better access and services to support public recreation on rivers, and protection of cultural heritage sites . While hydropower operations can cause negative environmental impacts, the way a project is operated can make a big difference in its degree of environmental footprint. Projects can manage flow releases from dams to ensure there is enough water in the river to support native species. Flows can also be scheduled to mimic natural flow patterns, which help transport sediment and mimic biological cues that would have been provided by the natural flow cycle. Retrofitting dams with fish passage equipment and even removing dams in some key river reaches can greatly improve access to upstream habitat. Hydroelectric facilities that want to reduce their environmental impacts can undergo a voluntary certification program developed by the Low Impact Hydropower Institute (LIHI). LIHI is a nationally recognized independent nonprofit organization dedicated to reducing the harmful impacts of hydropower generation by creating a credible and transparent standard for consumers to use in evaluating hydropower. Through the establishment of the Low Impact Hydropower Certification Program, LIHI certifies hydropower facilities with environmental and social impacts that are low compared with other hydropower facilities based on objective criteria. To be LIHI-certified, a facility must adequately protect or mitigate its impacts in the following areas: river flows, water quality, fish passage and protection, watershed protection, threatened and endangered species protection, cultural resource protection, recreation, and facilities recommended for removal. The certification criteria are based on the more recent and most stringent mitigation measures recommended for the hydropower project by state and federal resource agencies, even if those measures are not a requirement for operating the facility . Advances in ‘fish-friendly’ turbines and improved data collection techniques to increase the effectiveness of fish passage technologies create exciting new opportunities for the hydropower industry. If constructed and operated in a manner that minimizes environmental and cultural impacts, hydropower projects can provide low-cost, clean sources of electricity to urban and rural areas throughout the world. Harvesting the power from our rivers can be part of a smart and diverse set of solutions for reducing our dependence on fossil fuels, and the impact they have on our climate and public health. The ability to ramp up and down hydropower generation is a valuable source of flexible generation on the electricity grid, which can directly displace coal and natural gas, and help integrate larger amounts of variable renewable energy resources, like wind and solar power. Since most developed countries have already developed their most accessible areas for large-scale hydropower, growth of these projects will likely be concentrated in nations with growing populations and developing economies. According to the International Hydropower Association, more than 30 GW of new hydropower capacity was commissioned in 2012, with significant investment occurring in South America, Asia, and Africa . In Brazil, three large projects are under construction in the Amazon region totaling more than 22 GW of generation capacity. The potential to develop new large-scale hydropower projects in the United States is generally low. However, the U.S. Department of Energy and the Oak Ridge National Laboratory released a hydropower mapping tool in 2014 that estimates more than 65 GW of potential new hydropower development across more than three million U.S. rivers and streams that currently do not have hydropower development . The study identified western states, including Alaska, California, Colorado, Idaho, Montana, Oregon, and Washington as having the greatest new hydropower development potential. The study builds upon a DOE-funded study released in 2012 that estimated 12 GW of hydropower potential at the nation’s 80,000 non-powered dams . There is also additional potential to increase electricity generation at existing hydropower projects by expanding storage, upgrading equipment, and increasing efficiency. Fearnside, Phillip M. 1989. Brazil's Balbina Dam: Environment versus the legacy of the Pharaohs in Amazonia. Environmental Management, July/Aug 1989, Volume 13, Issue 4, pp 401-423.
 International Rivers. Online at http://www.internationalrivers.org. Hydropower Reform Coalition. Online at http://www.hydroreform.org. Low Impact Hydropower Institute. Online at http://www.lowimpacthydro.org. International Hydropower Association. 2013 IHA Hydropower Report. Online at http://www.hydropower.org/report. U.S. Department of Energy (DOE). 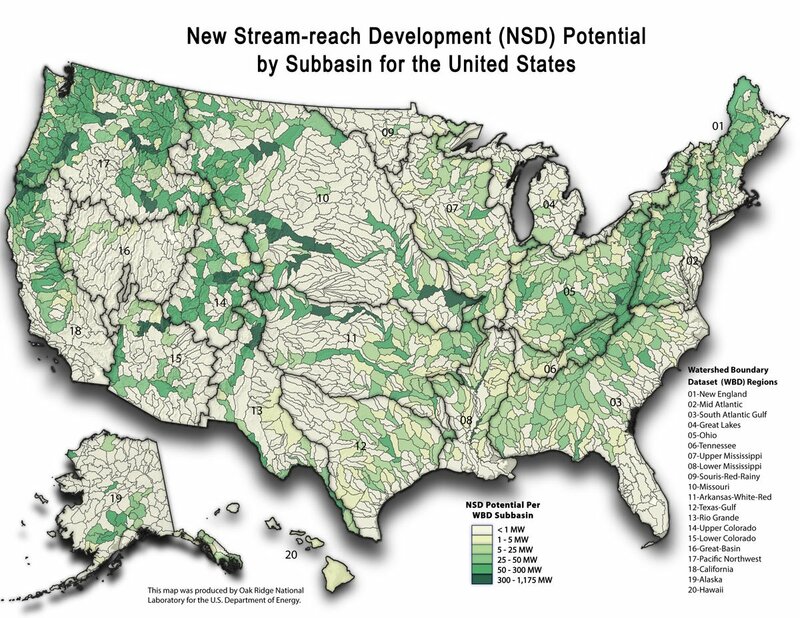 New Stream-reach Development Resource Assessment. Online at http://nhaap.ornl.gov/nsd. U.S. Department of Energy (DOE). An Assessment of Energy Potential at Non-Powered Dams in the United States. April 2012. Online at http://energy.gov/sites/prod/files/2013/12/f5/npd_report_0.pdf. We can shift our nation away from dirty fossil fuels and toward cleaner, renewable sources of power—but not without you. Your generous support helps develop science-based solutions for a healthy, safe, and sustainable future. See how the United States can dramatically expand renewable energy. Installing rooftop solar panels has never been more affordable. Urge your member of Congress to sign on to a congressional letter in support of robust funding for critical clean energy research.